It’s that time again, folks. Time for sun, sand and bare feet (if you’re lucky), as the hot days of another sweltering summer head in to stay all over our beautiful Carolinas. We’re superior to most in making the best out of a scorcher but it’s never too late to add a book to that beach, lake or pool bag to help you beat the heat. In the tradition of both old and new, here are a few books by those tried and true as well as a new kid on the block on the literary scene. Enjoy. In acclaimed author Elizabeth Gilbert’s first return to fiction since her colossal success with [Eat, Pray, Love,] she’s chosen to entrance readers with a historical journey rich in both detail and scope. The narrative of the Whitaker family is one of fascinating proportions, journeying across both centuries and the entire globe. It’s meticulous in its attention to detail, botanical motif and complex characters of all types, including the quite progressive heroine Alma Whitaker, her tycoon globe trotting father Henry Whitaker, and her Utopian-minded paramour Ambrose Pike. The research for this work of robust fiction supposedly took over three years and it shows in every way. It’s simply ideal for a lengthy summer indulgence. 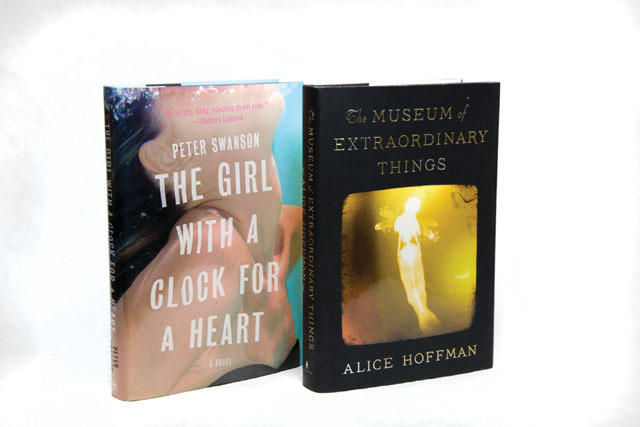 For those readers who prefer to walk on the darker side, Alice Hoffman’s newest work is just the thing to dive into this sizzling summer. The pages of this gothic and yet mainstream novel are filled to the brim with odd curiosities, peculiar characters and out of the ordinary plot twists. It is anything but your average work of fiction, as it unfolds with the story of the beautiful but blighted “mermaid” Coralie Sardie, whose world is full of what many would consider freaks (but she finds to be family) at The Museum of Extraordinary Things on Coney Island. However, yearnings for a life of her own beyond her adoptive father’s sinister reach and a chance at forbidden love with the enigmatic Eddie Cohen may drive her into danger or the love of a lifetime. Told during the turn of the century in a burgeoning New York City, the work will sweep you up in its spellbinding chronicle of mystery, magic and mayhem. Debut author Peter Swanson has definitely got the attention of thriller lovers with his introduction into the literary world. [The Girl with a Clock for a Heart] is fresh, modern and completely unexpected. For George Foss it is a tale of old love turning sinister when a former flame unexpectedly shows up at his favorite local bar and asks for a favor. However, with the stunning Liana Dector, one simple favor can turn into a Pandora’s box of potentially deadly secrets and intrigue. A tale of a sordid past coming back to haunt in the present, the novel is fast paced, effortless and impossible to put down. In other words perfect for summer.